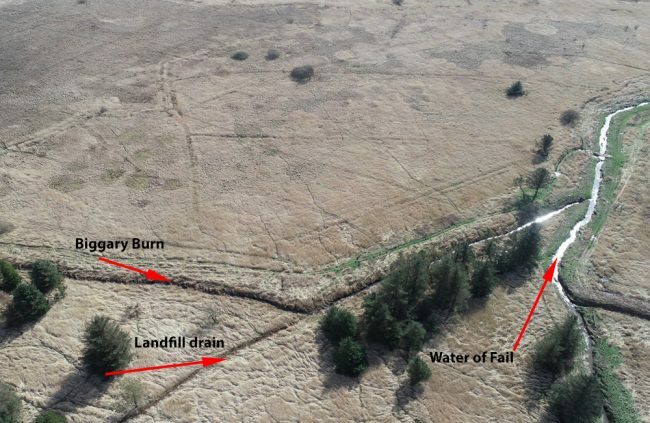 Ayrshire Rivers Trust | Tarbolton Landfill: A Ticking Timebomb! 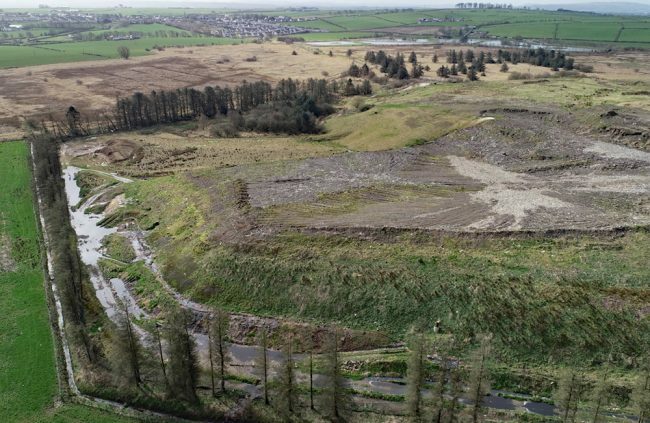 Tarbolton Landfill: A ticking time bomb that should never have been allowed to develop on what can only be called a wetland habitat. For nearly a year, Tarbolton Landfill has been closed after the parent company went into liquidation. All operations on site ceased and the pumps were removed. The Water of Fail flows beside the coup which was constructed on a wetland. 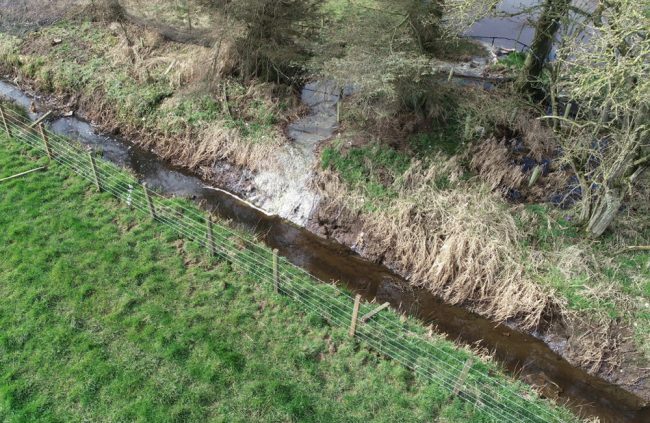 The threat of pollution affecting watercourses surrounding the landfill was until recently determined to be low but this is now described as ‘high risk’ by SEPA, the regulator. The winter rainfall inevitably leads to surface run off and ground water levels rising and after the wettest month for some time, currently run off is obvious from around the site. There’s nothing encouraging about this current situation at the landfill and with uncontrolled seepage and run off and invasive plants rampaging out of control, we have a tough battle ahead for the next few decades and that of course relies on some organisation stepping up to the plate and taking responsibility for sorting out this mess. 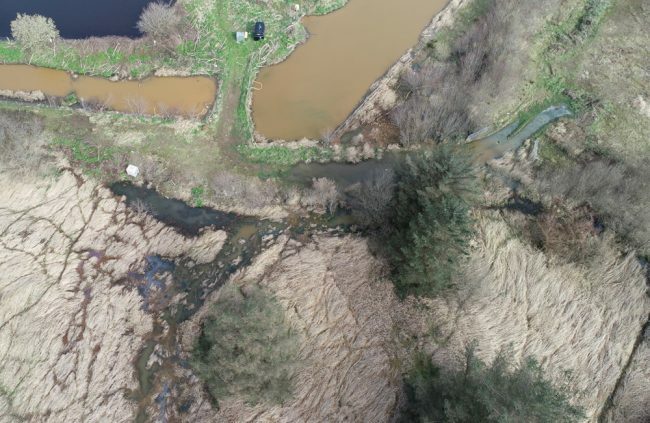 With March rainfall almost reaching 180mm (so far) this has been the wettest month since January 2017 so it is little wonder that the leachate from this toxic dump is now spewing into the tributaries that in turn reach the Fail and then the River Ayr. An environmental disaster is unravelling before our eyes and neither SEPA nor Scottish Government are able to resolve it, so it seems. Now SEPA are not to blame for the current situation despite what some would have you believe. They are a regulator not a contractor and therefore it is not their responsibility to operate or maintain any landfills. However they are responsible for ensuring that the operation doesn’t lead to pollution. At the moment, SEPA are caught between a rock and a hard place with everyone looking to them to resolve the mess left after the company went into liquidation. They may still be able to instruct work to take place to address the pollution issues but at this point in time, this remains unclear. It has happened previously but rarely. What would help if the Government stepped in to underwrite essential pollution prevention measures until the legal wrangling can be sorted out. What makes matters worse is that this company operated from England and therefore under English Law, they can effectively walk away free from their responsibilities. Resolving this situation satisfactorily through the courts may take years. In the meantime we watch as the rivers are polluted with chemicals dissolved in run off emminating from the site. Struan and I visited this morning and filmed the situation. It has worsened since our last visit and I expect that will continue in the near future. We really do need intervention now rather than in 6 moths or a year’s time by which the damage may be extensive. Leachate spews from the site into a watercourse. We also noted that Gian Hogweed surrounds one of the lagoons that eventually spills down into the Biggary Burn and the Fail. If this isn’t addressed this year, it will lead to widespread reinfestation on miles of river that has been under control for over 10 years. We will attempt to address this problem and will continue to drive for resolution of the larger problems as best we can. 4 Responses to Tarbolton Landfill: A Ticking Timebomb! I’d meet with you anytime that suits. Give the office a call and ask for Stuart. Is it possible for SEPA to pursue the Directors of the Company on a legal basis, either for civil or criminal action regarding the pollution? No I doubt it now that they are in liquidation. They still operate multiple businesses but as far as I understand it, they are discharged from their responsibilities under English Law for this site. This is one of the main problems…the company operated in Scotland but was registered in England therefore there lies a problem between the English and Scottish Law and determining through Courts how things should proceed. In the meantime, until this can be resolved, nothing has or is about to happen that will improve the situation.